We've definitely got a lot more on our plates this time. Lord British is gone, the three Shadowlords are running amok and corrupting people (most notably Lord Blackthorn), Britannia's virtues have been twisted into an oppressive set of laws, our allies are all in hiding for fear of imprisonment or execution, and it's implied the shrines have been destroyed as well. Not to mention that the game is considerably more stingy with funds this time and enemies are more vicious than ever. Well, when in doubt, gather some information, right? As you can see, this game is a lot more procedural than the previous Ultimas; you'll have to put a lot of work in to make progress in addition to the usual detective work to uncover clues and leads. However, you can save yourself at least a little bit of work if you made sure to write down all the Mantras from the previous game (otherwise you'll have to re-learn them here, and people may not be willing to give them up unless you have exceptionally good Karma to earn their trust). The virtues also aren't as big of a concern this time, though you should still try to maintain positive Karma to get people to trust you (which also affects shop prices) and lessen the experience penalty when someone dies. It's also worth your while to do the Shrine quests - not only do they boost your stats, but doing all eight will earn you a very important password for the end of the game. In the basement of Castle Britannia you can unlock this door (via a Skull Key or a fifth-circle In Ex Por spell) and find three chests inside. 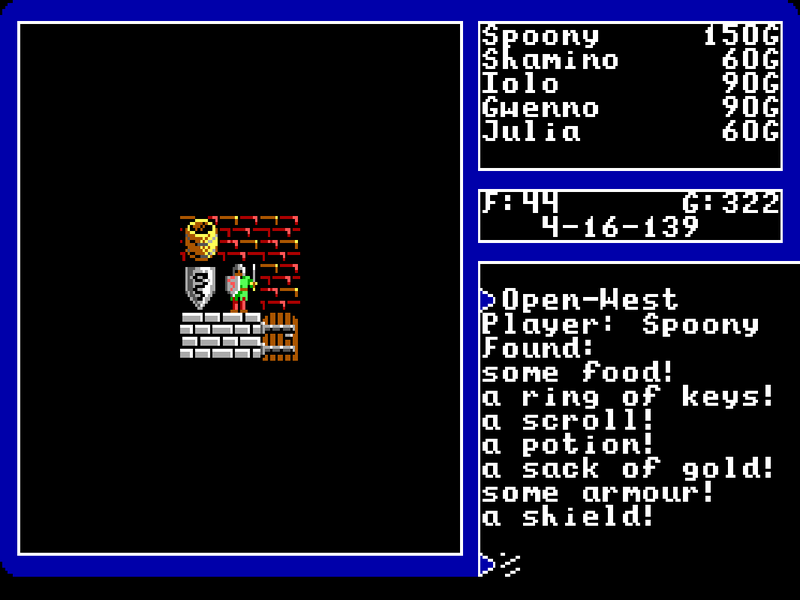 Each one contains a big stack of armor, weapons, items, food and gold, sometimes including Magic Axes. They also regenerate each time you exit and re-enter the basement, so you can use this to your advantage to collect a mountain of goodies very quickly. However, the game does consider this stealing, so you'll take a Karma hit for each chest you open. Of course, you can always earn your Karma back later (by donating money at shrines, among other methods), but it's not wise to go around with low Karma for long periods. Not only does it generally make your life more difficult as mentioned above, but you can hit an impasse when you need a Mantra or Word of Power and the person who has it doesn't trust you enough to give it out.